Please step away from the all-you-can-eat smorgasbord, there’s a wonderland of Waikiki breakfasts waiting for you outside your hotel. Breakfast is, by far, my favourite meal of the day. As a former Sydney-sider, weekend brunch was a mandatory event and I was absolutely spoiled for choice when it came to the city’s cafe scene. On my first few visits to Hawaii I really struggled with breakfast. Don’t get me wrong, the hotel buffets are sensational (some even have fried chicken on them!) but after a few days your clothes start to feel tight and you begin craving a more portion controlled experience lol. 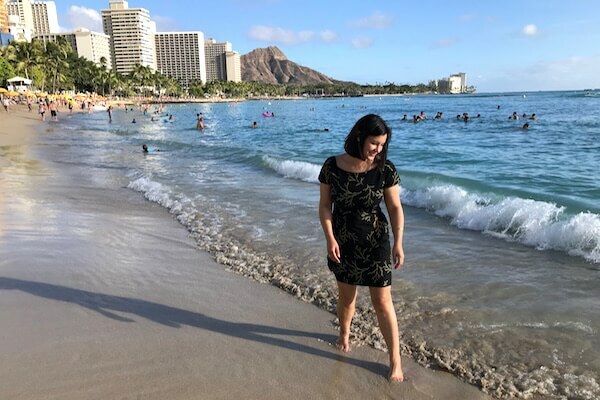 Thankfully there are great cafes and restaurants in Waikiki, you just need to know where to find them! 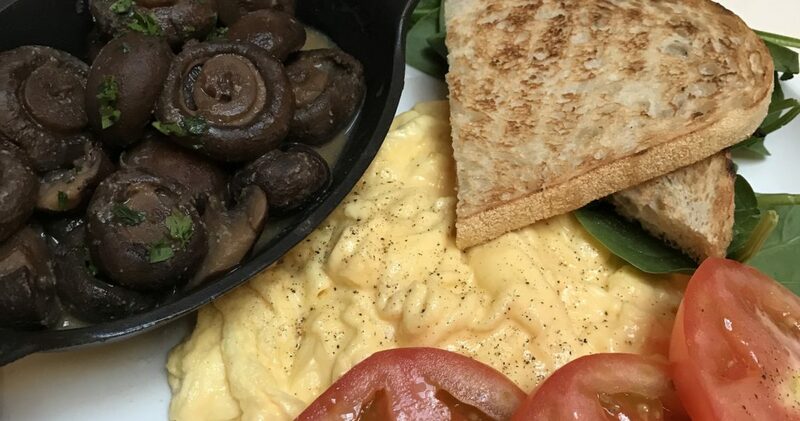 From organic food, hotcakes and toasted sandwiches to Italian crepes, acai bowls and Hawaii’s loco moco, here’s a list of my favourite Waikiki breakfasts. If you happen to be a caffeine-only kind of morning person, I’ve also got you covered here Hands Down Best Coffee in Waikiki. Find it at the Shoreline Hotel Waikiki. Heavenly Island Lifestyle is the perfect local eatery, right in the heart of Waikiki. It’s cosy inside, and the food is good for you. Sample fresh, organic ingredients sourced from across the Hawaiian Islands. Perfect for the clean-eating visitor. Definitely try local farm eggs flat eggs omelette add Kahuku shrimp (pictured). Also known for Big Island honey french toast. Find it at the base of Diamond Head, a 20 minute walk from central Waikiki. ARS Cafe Gallery is a neighbourhood cafe, that doubles as a mini art gallery. It’s reminiscent of an early century English bar, and the food is delicious. Sample the best loaded toasts and coffee in town. 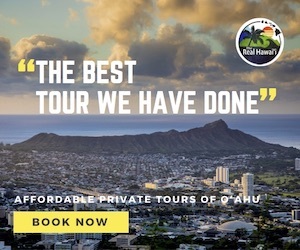 Perfect for the hiking visitor (the Diamond Head Summit Trail is nearby). Definitely try the avocado toast with egg (pictured). Also known for baked goods including banana bread. Find it in the garden at the Royal Hawaiian Center. Il Lupino Trattoria & Wine Bar is refined Italian dining in a prime Waikiki location. It’s blessed with an outdoor terrace, and the food is a little bit fancy. Sample a seriously good breakfast menu. Perfect for the distinguished visitor. Definitely try the brunch cocktails like a Bellini (pictured) or Mimosa. Also known for eggs benedict, of the filet mignon, lobster and crab cake variety. Find it at the top end of Beach Walk, next to Hard Rock Cafe Honolulu. Bills Hawaii is a chic restaurant with an relaxed island vibe. It’s famous for breakfast, and the food is created by Bill Granger an Australian chef. Sample classic dishes like sweet corn fritters and full breakfast with poached eggs. Perfect for the Aussie visitor. Definitely try the ricotta hotcakes, banana and honeycomb butter (pictured). Also known for bills spiced bloody mary. Find it at the Park Shore Waikiki Hotel across from Honolulu Zoo. Breakfast hours daily 6:00am-7:30pm (all day). Tucker & Bevvy Picnic Food is perfect for a quick meal on the run. It’s a picnic lovers paradise, everything can be packed to-go for breakfast at the beach or park. Sample tasty toasted sandwiches, freshly squeezed juices and smoothies. Perfect for the great outdoors visitor. Definitely try the turkey + brie toasted sandwich. Also known for fruit salad with yoghurt and house made granola. 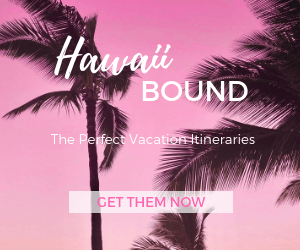 Find it by taking a leisurely 20 minute stroll from central Waikiki. Breakfast hours daily 9:00am (all day). Diamond Head Cove Health Bar is a casual cafe tucked away at the foot of Diamond Head. It’s always busy inside, and the menu is full of healthy choices. Sample salads, wraps, freshly squeezed juices and smoothies. Perfect for the health-conscious visitor. Definitely try the “Da Hawaiian” acai bowl made with paiai waiahole waikane (Hawaii moi taro), acai fruit, strawberries, blueberries, Big Island lehua honey and bee pollen (pictured). Also known for Diamond Head Cove kava. Find it on at Queen’s Beach in Kapiolani Park, at the east end of Waikiki Beach. Barefoot Beach Cafe is a oceanfront diner in front of the surf spot known as “publics”. 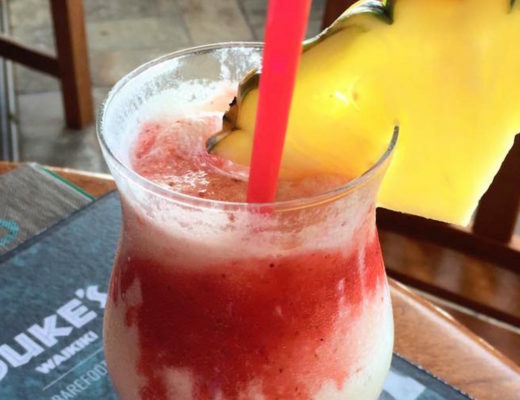 It’s got the best seat in the house on Waikiki Beach, and the food is made-to-order. 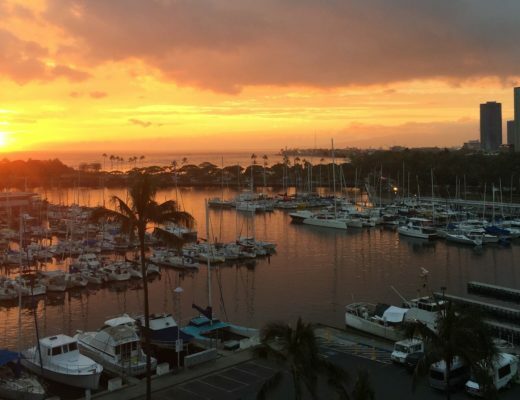 Sample Hawaii local grindz with a view! Definitely try The Royal Loco Moco, a barefoot burger, gravy and one egg with fried rice. Also known for eggs any style with meat, fish, steak or shrimp. 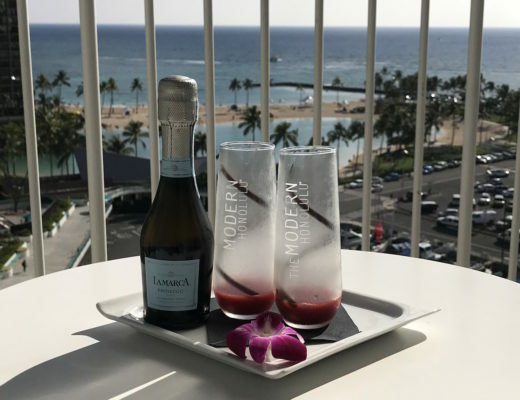 Find it at the Ilikai Hotel & Luxury Suites on the west side of Waikiki. Cinnamon’s at the Ilikai is a Mom and Pop restaurant from Kailua that expanded into Waikiki. It’s an outdoor venue with great views over the marina, and the food is award-winning. Sample generous portions of hearty cuisine served with aloha. Perfect for the hungry visitor. Definitely try guava chiffon pancakes (pictured) and red velvet pancakes covered in white chocolate sauce. Also known for their side serves of country tots (potato gems). Find it on the ground floor perimeter of the Waikiki Beach Marriott Resort. Arancino di Mare is a casual Italian restaurant with a nice outside patio in the heart of Waikiki. It’s al fresco dining, and the food is traditional Italian. Sample a mix of imported ingredients from Italy, and fresh seafood and produce from Hawaii. Perfect for the visitor that likes to try something different. Definitely try the prosciutto, arugula and tomato crepe (pictured). Also known for their fresh seasonal fruit, granola and hawaiian honey crepe. Find it on the east end of Waikiki by Hawaiian Style Rentals office. Waikiki Beachside Kitchen is a hole-in-wall establishment. It’s small inside, and the food is best ordered to take-away. Sample cheap and cheerful fast food. Perfect for the thrifty (or hungover) visitor. Definitely try egg, bacon, cheese and guacamole english muffin or burger. Also known for bagel sandwiches.